This is something beyond the usual stuffed pasta. And the sauce….mmmmm. 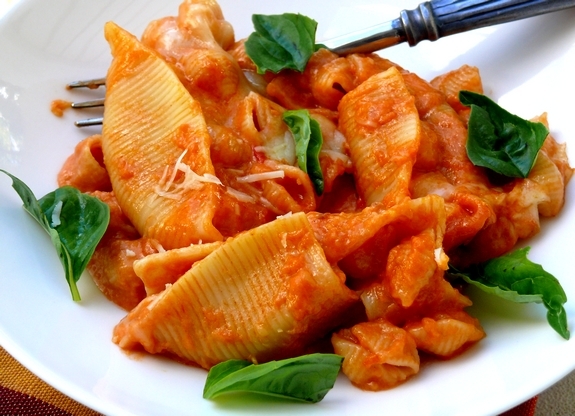 The vodka sauce is a great addition here, it has such a great flavor. Also a great meatless dish, if you need one. 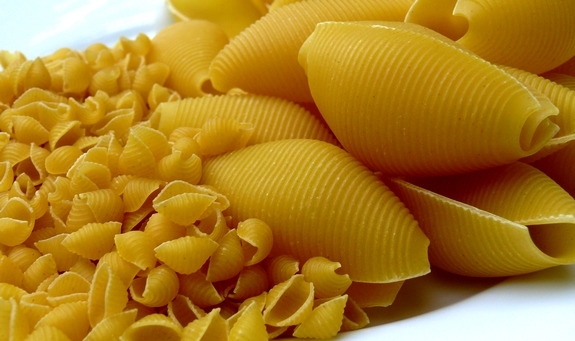 Deconstructed,this dish consists of these great big pasta shells….full of tiny pasta shells, oozing out with the incredible taste of Gruyere cheese. You could substitute the Gruyere with another, less expensive cheese, but I wouldn’t. It has such a great flavor and I love the way Gruyere strings out after it melts. The recipe also calls for a vodka sauce. Emeril makes a great bottled variety sold in grocery stores…it’s really good and helps make this recipe taste fantastic!! Make it soon, you’ll love it! Preheat oven to 350o F. Cook jumbo shells according to package directions. Using a large slotted spoon, transfer shells to a colander. Rinse with cold water; drain well and set aside. In same pan cook tiny shells according to package directions. Drain; set aside. Meanwhile, in a large saucepan combine Gruyere cheese, cheddar cheese, half-and-half and pepper. Heat over medium-low heat until cheese is melted and smooth, stirring frequently. Stir in tiny shells. 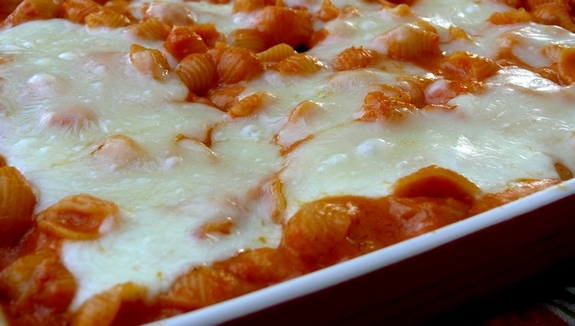 Spread 1/2 cup of the pasta sauce in the bottom of a 3-quart rectangular baking dish. 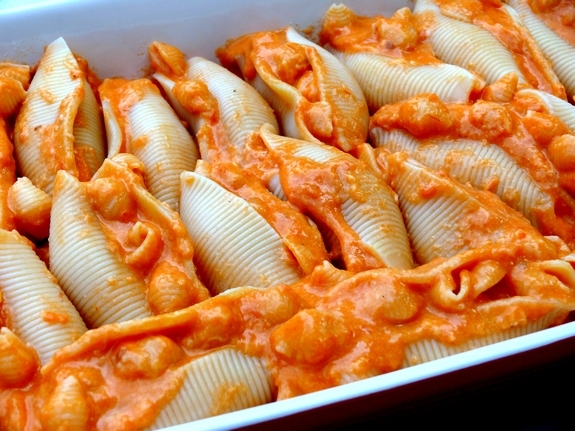 Spoon cheese-shell mixture into drained jumbo shells; place stuffed shells in prepared baking dish. Top with remaining pasta sauce. Bake, covered, for 30 minutes. Uncover and sprinkle with mozzarella cheese. Bake, uncovered, about 15 minutes more or until heated through. Let stand 10 minutes before serving. Preheat oven to 350 degrees F. Cook jumbo shells according to package directions. Using a large slotted spoon, transfer shells to a colander. Rinse with cold water; drain well and set aside. In same pan cook tiny shells according to package directions. Drain; set aside. Bake, covered, for 30 minutes. Uncover and sprinkle with mozzarella cheese. Bake, uncovered, about 15 minutes more or until heated through. Let stand 10 minutes before serving. Top with fresh basil and serve. I love the idea of big shells impregnated with baby shells! Now there is an innovative idea Cathy. I saw that recipe in BHG and it has my husband’s name all over it. Can’t wait to make it! I would put up with my lactose intolerance problems to eat this. My mouth is watering. This looks absolutely amazing! I knew I was going to be sorry for clicking that link as hungry as I am. Yummy! I look at all the quick meals you prepare and in my head I see how you juggle your time btween the vineyard and the kitchen. You are an inspiration!! Stuffed shells was a popular lunch served in our school cafeteria. Of course, your version is much better. Thanks for the memories! This is a great recipe. Quick and ooey-gooey delicious. Another bookmarked. Gotta find a way to incorporate bacon. Maybe add some crumbles to the vodka sauce. Yum!!!! My kiddos are coming home next weekend, and they will love this! Wow. That’s a lotta pasta. Shells in shells. I’m dying for that cheese sauce. It’s a nice change from the standard ricotta filling! I saw this in the October BHG magazine as the “Prize Tested Recipe” winner. 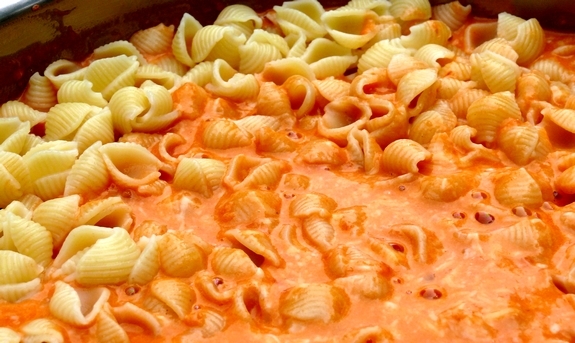 It looked good, but I was hesitant to try it as I’m not a huge vodka sauce fan. I’ll try Emeril’s! I’m sure all 3 of my children will love it, and it’s EGG-FREE which is a requirement for us due to allergies. Thanks for the info. Mmm, I love vodka sauce. What a great idea to put it on baked shells. Love the idea of this! And I agree, sometimes you have to splurge on the good cheese every once in a while! Stuffing shells with shells? Who’d’ve ever dreamed it’s possible? Now I’m hungry! Great recipe…something I never thought to do! 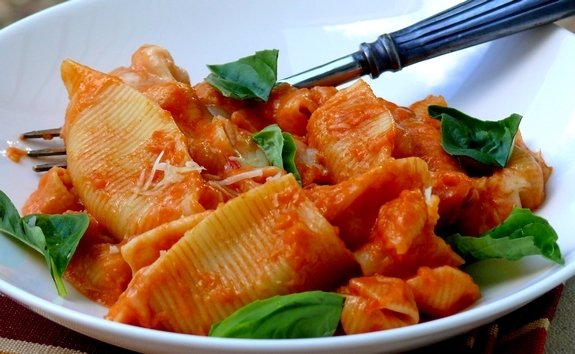 Vodka sauce is my favorite! I could eat it like soup. It’s finally cool in Los Angeles, this could be perfect for supper tonight! Holy cow! I made this, this weekend, and it was as amazing as it sounds! I made my own vodka sauce though – Definitely keeping this recipe in my files and have already shared with others!! I have been obsessing over this dish since you first posted it. I have a tried and true stuffed shells recipe that I love but this one blows my mind! Jumbo shells exploding with baby shells… and your photos make it look so darn amazing! I’ve never tried vodka sauce, the thought of sauce tasting like vodka has always turned me off, but this post has prompted me to give it a go! Oh my cheesy goodness! This looks fabulous! Another one to put on the list for this weekend!